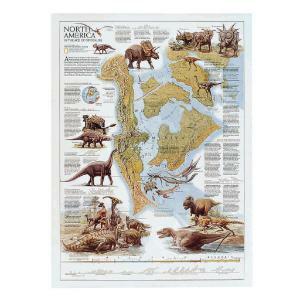 A different type of map than the usual from National Geographic, this large, colorful poster features accurate illustrations of a variety of dinosaurs as well as a detailed depiction of the North American continent. It includes brief descriptions of ankylosaurs, sauropods, hadrosaurs and pachycephalosaurs, ornithominids and troodontids, ceratopsians, and tyranosaurs, as well as an account of the inland sea that once occupied an area of the continent just east of the Rockies. The map also features locations of dinosaur fossil discoveries, and a timeline showing when different dinosaurs existed is printed below the map. Size: 22 1/4" x 30 1/2".